Every third Friday of the month, a group of Scouts — boys and girls — gather to learn skills, like first aid, knot-tying and explosives awareness. Yes, they learn what to do if they come across a bomb. Scouting prepares youth for life, and unfortunately, in war-torn Afghanistan, part of that life includes knowing what to do around landmines. Still, Scouters who are stationed in Kabul as part of the North Atlantic Treaty Organization’s (NATO) support mission are devoted to imparting the lessons of Scouting to Scouts in the country’s capital. NATO service members from America, Great Britain, Norway, Australia and the Netherlands host meetings at the military base. They held a camporee earlier this year. Some members were Scouts in their countries; some are Scouters or are parents of Scouts, and some have no prior affiliation to Scouting and just enjoy helping. “All of us volunteers really love this time with the kids and feel this is so important for these kids that live in an uncertain scary time for them,” U.S. Marine Corps Lt. Col. Sarah Deal says. Outside of lessons in explosives awareness, Scouting in Afghanistan doesn’t differ much from Scouting in the States. Scouts camp, sing songs, lead service projects, play games, learn Leave No Trace principles and make crafts, a favorite of which are paracord bracelets, Deal says. Recently, the Scouts that meet at the base started a STEM program with solar experiments. 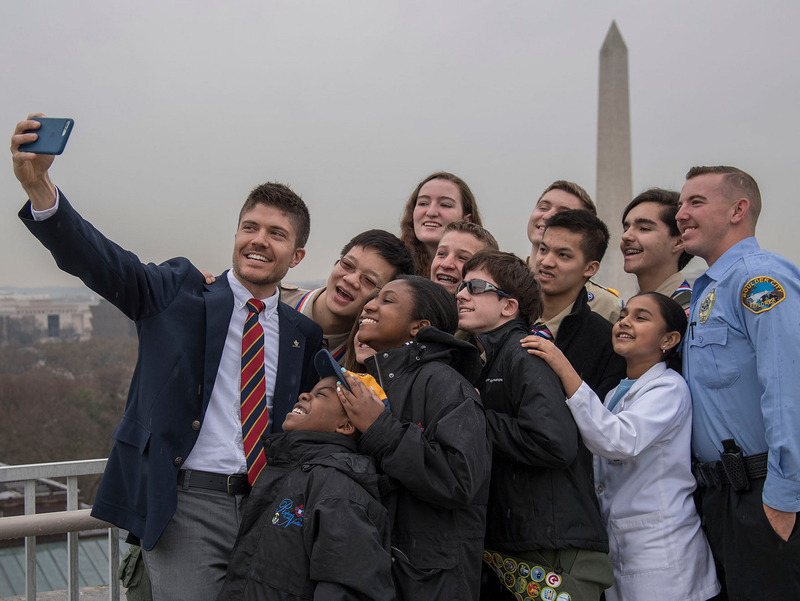 “The Scouts have special programs with learning about computers, solar power, and the like — with the leadership skills they are learning from the Scouts program, they have the opportunity to make a real change in their communities and country,” U.S. Marine Corps Capt. Mitch Altman says. Scouting in Afghanistan can be traced back to 1931, and reached its zenith in the 60s and 70s with 36,000 male and female members. The movement dwindled though as the country plunged into civil unrest and war. Under the Taliban rule, traditional Scouting was banned. Over the last decade, the program has been reborn thanks to national charities and donors. Volunteers, like those at the NATO base, have helped support the movement, which includes 1,800 registered youth in almost half of the country’s provinces. About 40 percent of those Scouts are girls. The volunteers’ mission is the same as it is with any Scouting leader: to instill values of leadership, service and good citizenship. At the NATO base, it usually takes two or three weeks of preparation for a monthly event, which invites troops from around the city and orphanages. That includes planning the activities, requesting security entrance for the Scouts and ensuring the food and handouts will be culturally and religiously appropriate. Adam Howland, an Eagle Scout and Major in the U.S. Air Force, has worked with the Scouts in Afghanistan since his first deployment to the country in 2015. One of his favorite memories came that year. Scout leaders had worked to send three Scouts from three different troops to the World Jamboree in Japan. When the Scouts returned, they thanked their leaders by presenting them each with patches from the jamboree. Another Scout leader favorite is a regular event held at the NATO base: multinational presentations. Since the base has personnel from all over the world, there are chances for Scouters to share what Scouting is like in their home countries with the Afghan Scouts. “The Scouts are very enthusiastic about learning about other places and feel empowered by realizing they’re part of a broader movement of Scouts,” Altman says. That movement comes together in moments like a service project that partnered Afghan Scouts with an American Scout troop. The U.S. troop shipped over materials to make memorial boxes for fallen service members, and the Afghan Scouts assembled and presented them to the chaplaincy, Howland says. Afghanistan is not a member of the World Organization of the Scout Movement since it doesn’t have a National Scout Organization yet, although it’s working toward being a full member. To see what Scouts are doing around the world, visit the World Scouting site.